Drobo's been delivering quality desktop storage for businesses and prosumers for awhile now, but previously, the company hadn't dipped its toe into Thunderbolt waters. But that's about to change with its two new units. The 5D is a BYOD desktop offering with two Thunderbolt ports and one USB 3.0 socket for connecting up to five hot-swappable, 3.5-inch drives to your Mac or PC. It also has an mSATA SSD for data-caching quickness and a variable-speed fan to keep things cool and quiet. We don't know exactly when the 5D will go on sale -- Drobo's not telling until July -- but it'll cost under $850 when it does, and that price includes a Thunderbolt cable. Meanwhile, the Mini is the first Drobo meant to be taken on the road. It packs up to four 2.5-inch drives in its front bays, plus, like the 5D, there's an mSATA SSD nestled in its underside that serves as a caching tier to speed up your main storage -- all in a 7.3 x 1.8 x 7.1-inch package weighing three pounds when fully loaded. All the drives are hot-swappable, a process made simple and easy with a trick, spring-loaded mechanism (patent pending) that lets users swap drives as they would SD cards. As for connecting the thing to your computer, dual Thunderbolt ports (for daisy chaining) and one USB 3.0 port reside round back along with the power plug and two vents for the Mini's variable-speed fans. Ringing the front face of the Mini are five LED strips that serve as drive indicators and capacity meter to let you know when a drive has failed or you're running out of space. Intrigued? Well, we got a sneak peek at the Mini and a little history lesson about its origins at Drobo HQ, so join us past the break for more. The Mini's shell is crafted from metallic carbon fiber coated in a grippy soft touch material with the Drobo logo embossed on top, and a magnetic front plate covers up those unsightly HDDs -- it's a very clean, appealing design. We got our hands on a prototype unit that was almost production spec (the Firewire ports didn't make it into the final design due to cost concerns), and we can certainly see the appeal of such a portable, robust storage solution. 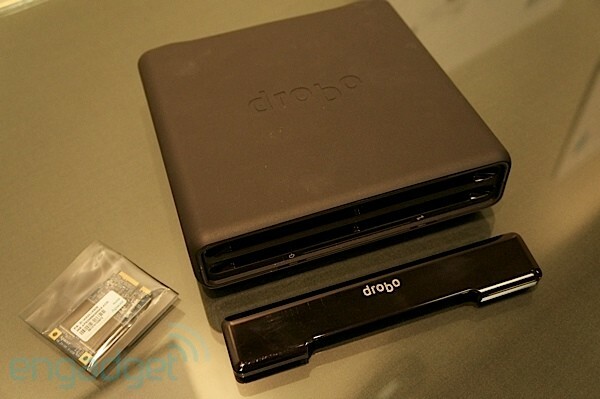 But, because it's such a departure from Drobo's previous products, we were curious as to how the Mini came to be. Turns out, its genesis was borne of company co-founder Julian Terry's desire for a Drobo that could fit in his office workstation, so Terry hacked together a bit of kit you see in the picture below. Terry's work was subsequently discovered by CEO Tom Buiocchi, who saw its potential as a portable solution for travel-weary videographers and photogs. After that, Terry designed and built the spring-loaded drive housing to complete the main Mini innards, and then it was a matter of designing the exterior and adding some elbow grease in the prototyping stage to get it ready for mass consumption. The result? A handsome, onyx number that'll sate most any mobile professional's storage needs for under $650 (drives not included). Best part is, Drobo addressed a common pain point with other Thunderbolt drives: the Thunderbolt cable's included. Unfortunately, as with the 5D, we won't know the Mini's exact pricing or availability until next month, but until then you can peruse our spate of pictures to feed your Drobo dreams. SAN JOSE, Calif. – June 21, 2012 – Drobo, maker of award-winning data storage products for businesses and professionals, today announced a wide range of industry-firsts with innovations in a new generation of storage devices for personal and professional users. The Drobo 5D and Drobo Mini – the world's smallest and most portable full-featured storage array - are designed to accelerate workflows for creative professionals managing data-intensive files; home media enthusiasts looking to consolidate and accelerate video, photo, and music files; and small businesses that need fast, portable backup to protect large amounts of data. Drobo, widely recognized as the maker of the easiest-to-use storage device, has added advanced performance to the new systems with Thunderbolt, USB 3.0, automated SSD acceleration and greatly enhanced hardware and software architectures. "In my 30 years covering the technology industry, I have not seen something as portable, scalable and powerful as the Drobo Mini," said Rob Enderle, principal analyst for The Enderle Group. "The SMB and prosumer market is clamoring for a plug-and-play storage product because it lacks the technical expertise and resources to manage complex storage systems. With the new Drobo products, there is no question that this enigma is solved." Both the Drobo 5D and Drobo Mini include industry-first SSD acceleration – utilizing the performance benefits of solid state drives (SSDs) and the capacity benefits of hard disk drives (HDDs) to deliver an automated, no-compromise system. In addition to supporting SSDs in any of their drive bays, both units include an additional bay that will accommodate a small-form-factor SSD to achieve significant performance boosts while making all drive bays available for high-capacity HDDs. The products also support both lightning-fast Thunderbolt (2 ports) and USB 3.0 connectivity, an industry first for storage arrays, that will provide flexibility to both Mac and Windows users. The two Thunderbolt ports allow customers to easily daisy-chain devices to accommodate massive growth, and the USB 3.0 port ensures compatibility to millions of USB systems. Along with SSD acceleration and Thunderbolt / USB 3.0 interfaces, the new Drobo products have been completely redesigned from the ground up with new hardware and software architectures. These enhancements provide a significant increase in processing capability and several optimizations to BeyondRAID™ that will increase baseline performance by at least five times – prior to the addition of SSDs – easily making the new Drobo 5D and Drobo Mini the fastest storage arrays in their class. All Drobos are based on patented BeyondRAID technology, which automates sophisticated data-protection algorithms so users can enjoy the peace-of-mind of safe data protection without having to be a storage expert. The new Drobo arrays add an advanced safety feature that also protects user data during and after power outages, another industry-first for professional storage and a feature that has traditionally been reserved for more expensive, enterprise-grade storage. "Our customers love Drobo's ease of use, but they want it all – the easiest, the fastest, the safest for their data, plus the smallest and quietest," said Tom Buiocchi, Drobo CEO. "That's why we're here – our new Drobos will deliver on our promise of the best storage experience ever." The Drobo 5D is the most modern and complete storage system for creative professionals including photographers, videographers, graphic designers and individuals creating and working with large amounts of rich media. In particular, professionals who are power users of Adobe and Apple applications including After Effects, Aperture, Final Cut Pro, Lightroom, Photoshop and Premier Pro are a great fit for the new product, which is ideal for editing, storing catalogs and backing up files of all types. With up to five drives with an additional SSD bay, the 5D can support up to 16 terabytes of protected, SSD-accelerated data. This is the equivalent of 32 million photographs, 4 million songs, 1 million HD movies, or 48 hours of uncompressed HD video – all accessible through lightning-fast Thunderbolt or USB 3.0 interfaces. Drobo Mini is a technical marvel that redefines personal, professional, and portable digital storage. It combines a unique blend of the most advanced storage technologies with unrivaled ease-of-use, all in a sleek, world's-smallest package, measuring seven inches square by less than two inches tall and weighing less than three pounds. Drobo invented a patent-pending "carrierless" design, which allows up to four 2.5" drives to be easily inserted into a Drobo Mini without the need for any additional drive carriers or screws. The benefit to the customer is not only the ease of drive insertion and removal, but also flexibility; because the design accommodates a common industry drive size, customers are free to choose the drive vendor, type (HDD or SSD), capacity, speed and price that best meets their needs. Since the Drobo Mini is portable, it features a ruggedized design that allows users to transport it with drives inside. In addition to being the first Drobo to offer this capability, the Drobo Mini features a custom miniature power supply and an optional carrying case, making it the ideal storage for professionals who travel extensively. "I will shoot thousands of images per day at the Olympics, and having fast, protected storage is critical to my workflow," said Jeff Cable, one of the few photographers representing Team USA at the 2012 Summer Olympics in London. "The new Drobo Mini provides Thunderbolt performance and RAID protection in a compact package that is not much larger than a single external drive. I can't wait to get my hands on one." Visit www.drobo.com/5D or www.drobo.com/mini to learn more about the new products. Ordering and availability information will be announced in July. Pricing – including a Thunderbolt cable – is expected to start at under $650.